We’ve been making them up since Adam and Eve. As parents, we’re notorious for grasping for an excuse to escape a parenting responsibility. These excuses are almost as dangerous as popular parenting tips that can cause misbehavior in kids. But I completely understand why we cling to these excuses. 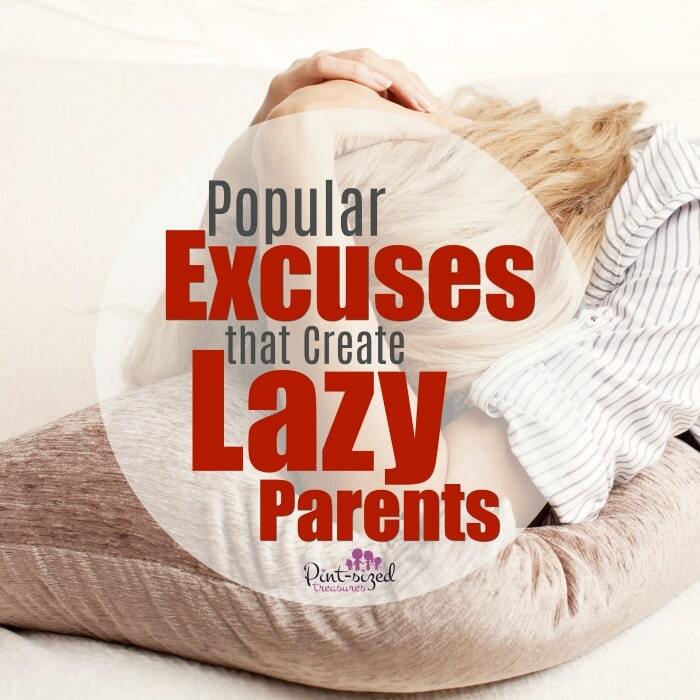 But repeatedly using and believing popular excuses can create a lazy parent. We often use excuses when we feel like failures. This article explains the reasoning behind this. But most of us don’t plan on beoming lazy parents. When we hear the first heartbeat of our unborn child we immediately daydream of the parent we desire to be. We want to do everything! We want to make gingerbread houses with our kids. We want to explore drama, music and art with our kids. We want to take our kids to all the “must see” theme parks. We want to take our kids camping — every single year. But somewhere on the parenting journey things may unravel. And when unexpected life turbulence comes, it’s then we have to remember we can’t hold onto excuses to stop being an intentional and involved parent. Keep doing what we know is best for our family and kids. Keep looking toward the future. Because the excuses we believe and hold to today will undoubtedly affect the future for our kids. 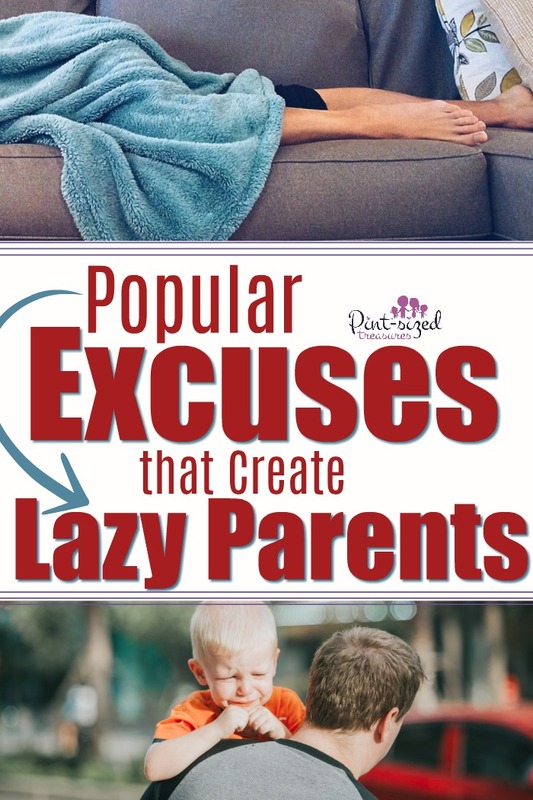 What are these popular excuses that create lazy parents? Let’s see how many we can discover! My kids are just strong-willed. Ever told yourself this when you gave into a toddler’s temper tantrum? You were tired or busy and this little excuse swooped into your mind and convinced you it was ok to give in…this time. But this time (Just like my starting a diet on Monday excuse..ha!) soon became the norm and lead to some lazy parenting. Here’s the truth: many kids are strong-willed. If you’re curious about yours, here are some characteristics of strong-willed kids. If we give ourselves excuses on why to give in, give up or stop giving consequences for negative behavior, we may very well become lazy parents. And that scares me. May we have the strength to fight making this excuse part of our parenting philosophy! God controls everything. Just last week I read on social media (Just one reason why I’ve been staying away from it more) vent that she believes God is completely in control of how kids turn out. And from a Christian viewpoint this sounds legit, right? God has the power to turn a child’s stoney, cold, defiant heart to a tender, kind and gentle one. I share a story about the child who made me cry myself to sleep here and how God worked in her little heart. However, taking the truth that God has the ability to change someone’s heart to the extent that God controls everything can easily become an excuse to be a lazy parent. Just enough truth to convince us that it really doesn’t matter if we yell at our kids or not. Just enough truth to convince us that we can be self-centered parents and everything will still happen as it’s suppose to happen. Why pray, sacrifice and invest the best years of your life into your kids if they’re going to turn out a certain way — no matter how you parent? But God has give parents a set of guiding principles for our parenting journey — and I’m extremely grateful for that! God also has little tiny nuggets of parenting wisdom tucked away in familiar bible stories and even in other Christian parents. I share one of my biggest parenting prayers being answered via another Christian in this post about winning your child’s heart. Though God is all powerful and all-knowing, He has placed parents as guides, teachers and protectors in our children’s lives. And we should take this job seriously and walk cautiously on our parenting journey. So many times I’ve begged God for wisdom in how to guide my children. He’s been so gracious in giving me the answers I need at just the right time. Even when you feel like you have an out of control kid, He’ll be there giving you the answers you need. If you simply ask him. But it’s up to you if you follow His guidance! God would have never given us parenting guidelines in His word if our actions didn’t affect our kids’ futures. Even the little things like teaching your kids manners matters in the big picture of parenting. It matters what we allow our kids to watch and listen to. It matters if we teach our kids to obey their parents. God is truly the only one that can change a human being’s heart, but God is also the one who gave us principles to guide our families. He expects us to be good stewards of everything he gives us — including the little people in our home. No one else has such a difficult time. We look around and see parents who have loads of support from friends and family and that makes us feel all alone. I’ve been raising our kids for ten years in a foreign country without family and just a handful of friends. If I focus on the support others have, it can easily make me use this as en exuse to be a lazy parent. Maybe you have to work an extra job (we’ve done the side job business too!) because you can never financially get ahead. Whatever your struggle, it’s still not an excuse to become a lazy parent. Every parent struggles in some areas. Some areas are clearly seen while others aren’t. This is definitely a situation where comparison is the thief of joy. Comparing your parenting hurdles with others will only drain your inspiration to keep praying, loving, guiding and sacrificing for your kids. I’m a very busy person. Busyness seems to be the disease of our generation, doesn’t it? We’re busy with our work from home businesses, busy with our community organizations, busy with our church commitments, busy with our Facebook scrolling, busy with our Netflix binging, busy with our online shopping, busy with our fantasy football line-up, busy with our vacation planning…and the list snowballs out of control. How many summers do our kids get under our roof? Our time of being a 24/7, always there, on-call, in-the-house parent is limited to those few years. Everything else, except our relationship with God and our spouse, should be put on pause if it tends to make us a lazy parent. You should never be too busy to be a parent. Period. I’m not supermom or superdad. No one expects you to be that! However, repeating that to yourself is slippery easy way to get out of establishing a naptime routine for your toddlers once again. It’s another excuse to not deal with your kid when he hits someone else. This same excuse rings in your ear when you don’t feel like making your kids clean their room. Your kids don’t expect you to be supermom, but they surely don’t want you to be a lazy parent. It just kind of sneaks up on us. Soon that visitor, if not shooed away, will find a comfy place to sit and stay quite a while. Maybe the full 18 years of our in-house parenting journey. Did I miss any popular excuses? If I did, please share them with me on Facebook in our All Things Mommy GROUP! I’ll definitely add them to this list so all of us can avoid being a lazy parent!